Jim Hartung was an influential member of the 1984 U.S. Men’s Olympic Team which achieved Olympic glory by winning the team gold medal. Hartung is an eight-time U.S National Team Member who has also competed internationally and collegiate. He began his gymnastics career at the Omaha Sokol gymnastics club in Nebraska . There, he was coached by Phil Cahoy, Sr. who he credits as his most influential coach. Jim trained at this club for twelve years and under his leadership he led his team to three state titles. He recorded 18 gold medals in competition at this time. After his club career ended, he attended the University of Nebraska . There, he was trained by famed coaches, Jim Howard and Francis Allen. 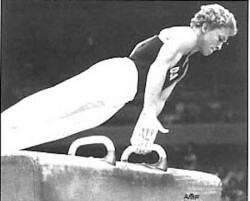 In 1979 Hartung made his first World Championship team where he placed 9 th All-Around. In NCAA competition Jim recorded 22 All-American rankings. Along with 4 team medals, he also picked up 7 individual medals including two all-around titles in 1980 and 1981. He also led Nebraska to the NCAA team title four consecutive times. He also was the first man to win 3 NCAA ring titles. In 1980 Jim made the U.S. Olympic Team but was unable to compete due to the U.S. boycott of those Olympic Games. In 1981, he once again represented the U.S. in World Championships competition. Here, he placed 7 th on Vault and 9 th on Rings. In 1983, Jim made his third World Championships Team. In 1984 he was named to the U.S. Olympic Team. Aside from his team medal, Hartung also made the Individual Event final on vault. Jim is now a brevet level judge. He and his family reside in Lincoln , Nebraska .